One of our philosophies as well as our priority is to care for your horse as if it were our own. 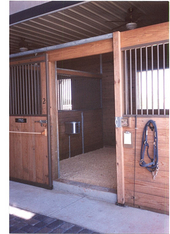 Our barns, quality built by Morton Buildings, have a total of 28 stalls and we board a maximum of 28 horses. We only offer full boarding. The barns each have a central fly spray system. There are two stall sizes: 12' by 12' and 12' by 16'. 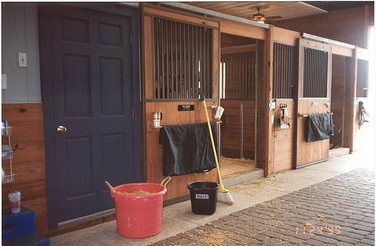 All stalls are matted, well lit, have corner hay mangers for horses to eat in a natural position, box fans mounted at eight feet above the stall floor, automatic waterers with water consumption meters, and large stall windows that open to covered porches or large overhangs. Horses are turned out during the day and in their stalls overnight. Our morning staff arrives at 8 a.m. to hay the horses and pick out stalls. Breakfast is fed at 8:45 and horses are given adequate quiet time to eat. Turn-out generally begins around 9:15. Once all the horses have been turned out, stalls are thoroughly cleaned and prepared for the horses to return in the evening. Dinner buckets are prepared by the a.m. staff, as each horse has a custom menu. There is a late night 'bed check' around 10 p.m. when treats are given and hay mangers are filled for overnight. High quality Mid South feed is fed, as well as alfalfa hay or Tift 44 Bermuda hay. We also use a daily dewormer so as to keep all the horses in tip-top condition and minimize pasture infestation. Paste deworming is done twice a year at no charge to the boarder. We use a pelleted bedding that we have found to be superior to traditional shavings. By spreading daily on our empty pastures, we fertilize our pastures and never have to be concerned about a manure/compost pile on the premises to attract flies. Locked tack rooms are provided for each boarder/horse to share with a few other boarders. Laundry can be done by our a.m. staff. Winter blankets can be sent out for cleaning for a nominal fee. Vet and farrier appointments can be made with our farrier who comes weekly and our vet who has been with us since the inception of the farm, as well as a number of other quality veterinarians in the area. Boarders may choose to make arrangements with their own vet within our normal business hours. Boarding fees start at $625.00 per month. Lessons and/or training are not mandatory with boarding, but can be contracted for separately with trainers on staff.